One of the reasons I love living so close to Delaware's beaches is the drive to and from Rehoboth from my bayside home near Ocean View, particularly toward the end of the day. I’ve painted sunsets I’ve witnessed from there many times. Sometimes when the sunset is particularly beautiful, I stop quickly on the side of the road to snap a cell pic to remember for future paintings. Other times I pull over in Delaware Seashore State Park’s bayside parking area south of Dewey. Eventide is inspired by one of many sunsets I’ve taken in from there. Whether cloudless in shades of red, pinks and blues as I painted Eventide or streaked with clouds edged in myriad shades of gold with rays of light streaming beneath them, seeing the evening sky and its reflections in the bay make this park a breathtaking and peaceful place to spend a quiet moment. One evening, take a break in the state park bayside near sunset. Park, sit in the comfort of your vehicle or get out and breathe in the salt air, listen to the calls of gulls and the water gently rippling at your feet and relax as the sky fills with color. You’ll be glad you did. 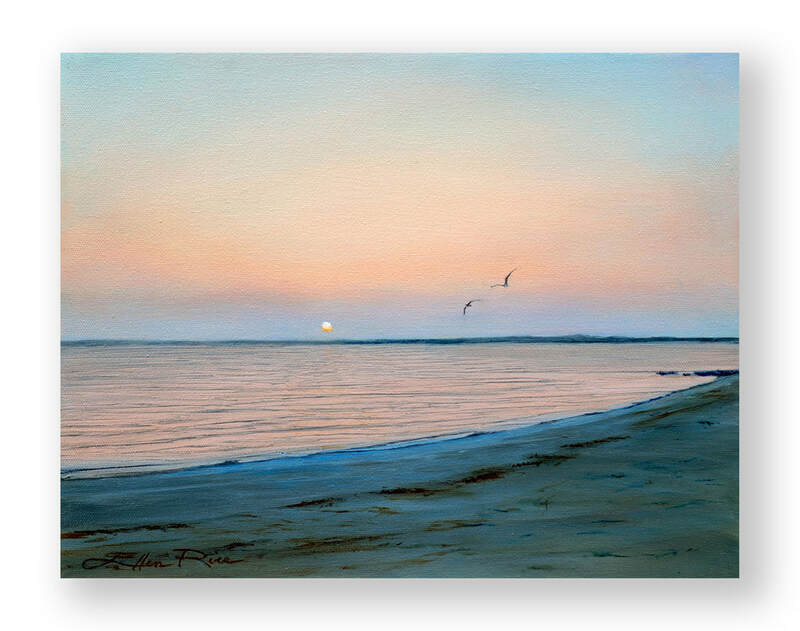 For more of my bayside paintings, please click here. You may also sign up to receive notices of my new paintings at the bottom of this page.